As far as fashion goes, the leather jacket is probably the biggest and most significant purchase you’ll make. A leather jacket can turn any outfit into an instant rockstar, motorcycle-riding look without even trying. It’s an iconic, timeless wardrobe statement that every woman desires to own, however, quality and longevity vary, depending on the price. With that being said, not each one is made the same. The cuts, zippers, material, and buttons differs, so make sure you’re purchasing one that will fit your personal style and your body shape! We’ve done some hunting of our own, and ended up with a list of the best leather jackets for women on the market, today. Let’s get started! While style doesn’t have to be technical, it sure helps to see an overview of each product so you can easily weed out which ones catch your attention and the ones that can be tossed aside. We’ve created this table to help you streamline the process and easily compare and contrast the jackets against one-another. 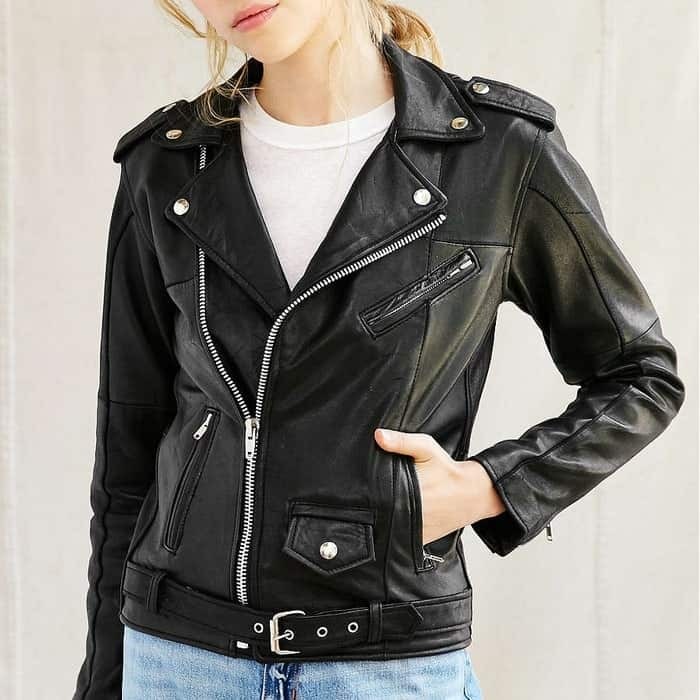 Now that you’ve gotten a good idea of what the best women’s leather jackets are, let’s scroll down a bit further to get more in-depth with each item, and answer any questions you may have about the products! Our first item on the list is the LL Women’s Hooded Faux Leather Jacket, which you can find for a steal on Amazon. This is a great option if you love the leather jacket look, but don’t want to cough up the cash for actual leather. Perhaps you like the look, but you’re a vegetarian/vegan and don’t feel quite right about wearing actual leather, either. In both of those cases, the LL Faux Leather Jacket is the best option for you! Made of 100% polyurethane, you can keep your wallet and beliefs intact, while trendsetting. If you need something to keep you warm and fashionable, the jacket is fully lined and features attractive exposed zipper details. The jackets come in various colors, so you’re guaranteed to find something to match your taste. Keep in mind, that the jackets do run a size large width wise, and the cut is a bit short. The only notable downside we experienced, was that sometimes the zippers got stuck when opening or closing, and you have to tug a bit harder. Great for vegans/vegetarians, or those on a budget. If you haven’t already heard of AllSaints, it’s a brand known across the fashion world for its unique jackets and premium leather. These two things should tell you right away, part of why we picked the Laurel to appear on our list. There will be very few fashion-related purchases we make as adults that we will be able to wear for years to come, that will still be relevant, and even in “wearable” condition. This piece is one of the exceptions to this. A relaxed-fit, longline premium leather jacket with thoughtful details will never go out of style. Let’s go more into detail about these “details”: press stud lapels, asymmetric zipper, a belted hem, and metal studs to the back hem are just some of these well-thought-out additions. If you’re one of those people who love the “feel” of quality clothing, then you’re in for a treat with this one. Soft, supple leather will have both you and possibly strangers petting your sleeves each time you slide this one on for a night out. Blackcurrant lining feels great against your skin, and durable silver hardware is hard to pass up. If you’re on a budget, there aren’t too many options on the market that are made of quality materials and possess good style. Stradivarius has changed that, with their sheep leather belted biker jacket. Stradivarius is a name you may not have heard of, but you’re about to. Owned by Intidex, the same one that owns Spanish brand, Zara, you can rest assured your products were made by talented hands. For all of the leather jacket newbies, this makes for a great transition product. The silver hardware perfectly complements any of the available colors, while the belt makes for a tighter, more tailored fit. Overall, if you’re looking for the best affordable leather jackets, this tops the list. What do you think of when you think of Seattle? Rain, coffee shops, and music may come to mind before anything else. When your eyes meet this beautiful piece of fashion, you could probably envision yourself sporting it while getting coffee or rocking out at a show, right? Did you know The Arrivals actually did use Seattle as inspiration for this jacket, but not because of the mentionables above? Yep, they used the city’s Rainier Tower and its unique architecture for inspiration, and we have to say, it panned out quite nicely. Made of high-pebble textural Italian lambskin, the structured leather moto features 3D horizontal channeling accents along the sleeves, with a luxurious, removable Toscana shearling fur collar for those days you’re feeling fancy…or just cold. The downside for some, is that it’s not quite “timeless”. The style is very modern and does not go with everything, like some of the other products on this list could. The name alone really says it all; these jackets are definitely made well, and at a less expensive price than many leather jackets of its quality. Madewell’s Washed Motorcycle Jacket is your basic, no-frills item but is still easily one of the best leather jackets in the world. Those soft, buttery leathers that look like you’ve had them for years are the best. After all, this kind of fashion is a lifestyle! This one is an authentic-looking moto that looks like you could’ve earned it in a bar fight with Hell’s Angels, but have the luxury of ordering from the safety of your comfy bed. The imported product comes with silver hardware, lapel snaps, and zip sleeves. The a-line cut is a flattering addition, and really makes the jacket stand out from the rest. Keep in mind when ordering, that they do fit true-to-size, so there’s no real guessing when it comes down to it. So, what are you to do if you want a black leather jacket, but still want something a little more feminine-looking? 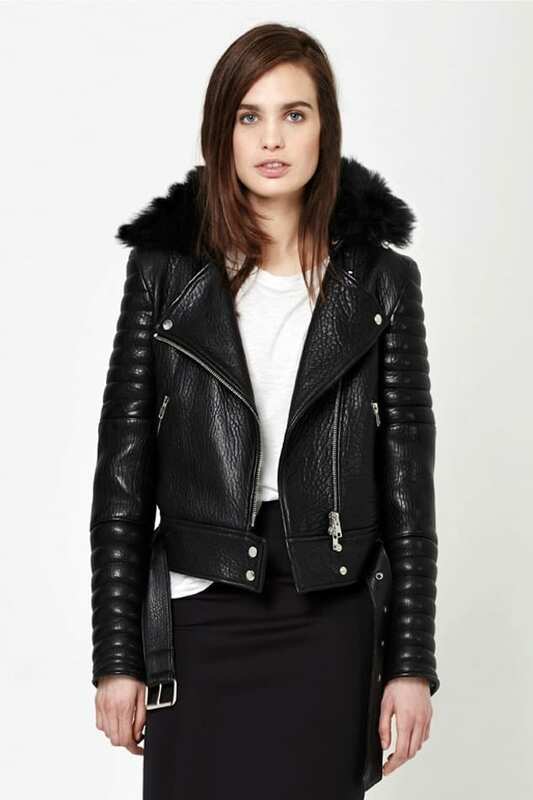 Asos has the answer for you, with their Premium Washed Cropped Biker Jacket. You still get the rocker girl look, but you don’t have to sacrifice shape. Many leather jackets, if not tailored according to a woman’s body, can have a boxy look. While that’s not always a bad thing, and sometimes even desired depending on the style, some women want a more tailored, tight fit. 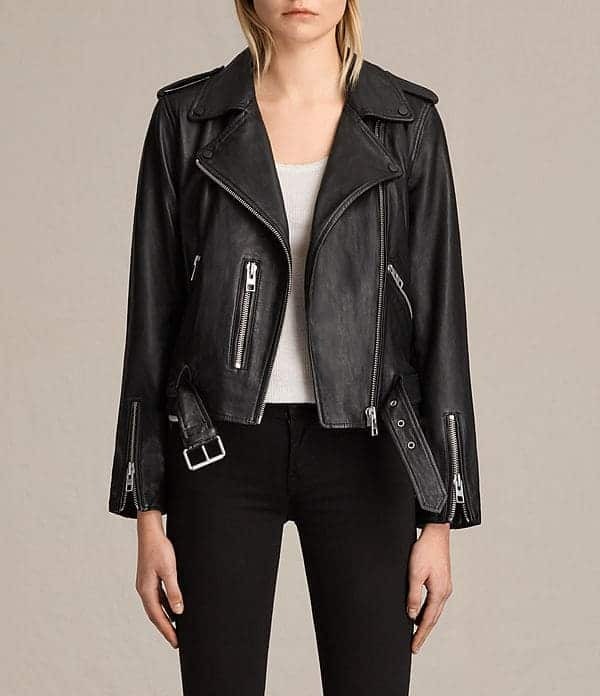 This affordable real leather jacket is taken in at the waist and cropped, so your waist is highlighted. Complete with shoulder epaulets, two vertical zippers, one asymmetric zipper, and a pin-buckle waist belt, you’ll receive that extra definition to show off your curves. 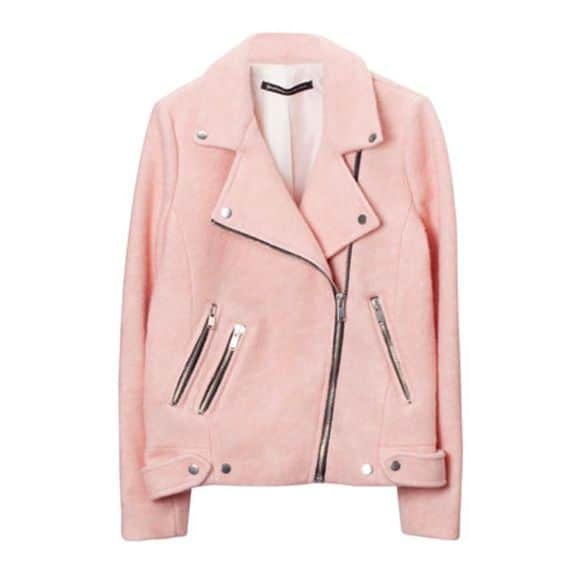 Pair this jacket with a dress or some skinny jeans, and you’re ready for the night! Buying a leather jacket is a feat in and of itself. You don’t want to waste your money buying one you don’t like, or one that’s not made to last. We’ve created a guide to steer you in the right direction so this doesn’t happen! First off, you must think about your style before buying a purchase like a leather jacket. Are you looking for something more feminine and tailored? Do you like relaxed and a bit looser? Do you prefer long or cropped? Hooded? Do you want a jacket you can wear with just about anything, or are you strictly looking for a jacket to place over a dress on a night out? What kind of leather do you want? Take all of these into consideration. A lot of details go under this category, and it isn’t just about the material, although, that’s very important. Cheaper jackets will use “corrected leather”. Corrected leather is leather from animals that have scarring, branding, or knicks as a result of how they were raised. This is then sanded down, and sometimes fake leather grains will be added, along with dyes and other chemical treatments. As a result of those treatments, corrected leather often possesses a plastic-like, smooth feel, as opposed to the buttery, uneven textures of uncorrected leathers. Linings may be equally as important as the leather. Cheaper linings will tear and shred faster, even while the leather holds up perfectly. They also feel dry and allow for less airflow through the jacket. No one wants to feel suffocated! 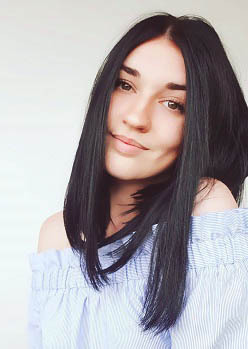 The higher quality linings are easy to identify, mainly because high-quality designers use two different linings: one for the sleeves and one for the body. The sleeve linings will typically consist of silk fabrics, while the body linings can vary between warmer cottons, sometimes quilted and insulated. 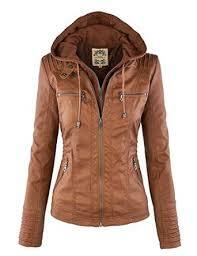 Zippers are also a notable factor to take into consideration when purchasing your women’s leather jacket. Most jackets are made with the YYZ brand, but those often stick or can break, while higher quality brands often use a RiRi zipper, which often last 10 times as long, and can even sometimes be a two-way zipper. 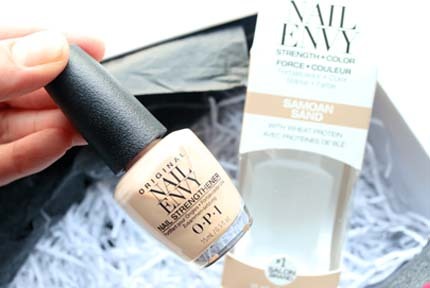 Black is the standard, while tans and browns are also quite common. If you’re going for a more unique or girly look, you could opt with a pastel pink, a deep red, or something completely different, like a blue. However, keep in mind that it’s easier to wear a leather jacket more frequently without people thinking, “didn’t they just wear that yesterday?”, if it’s a neutral color. Black also goes with everything. Now we’ve come to the least fun part, cleaning. However, it is also the most important part, if you want your leather jacket to last for generations. We’ve made it a little easier for you with this YouTube video that shows you, step by step, how to clean your leather jacket. It’s filled with great tips and ideas! As long as you’ve got each one of these categories figured out, you should be good to go! Of course, the price is also a determining factor, which is why we’ve offered products of every budget here. Depending on your style and tastes, any one of these could be your perfect selection. However, there were two that particularly stood out from the crowd for us. The first one, is the Rainier jacket from The Arrivals. This jacket is a complete head-turner in all the right ways, and have truly manufactured something well planned and unique. It is made of high-quality Italian leather, and comes with a removable fur collar, giving that avant-garde look. Our second selection was the Laurel Biker from AllSaints. The company is already known for its designs and leather quality, but the reason why we chose the Laurel, was because the design is something that can be worn time and time again, with just about any type of clothing. If you choose to not go with either of these two, feel relieved that any of these are the best women’s leather jackets out there today!